My first multi-style game featuring different genres in the soundtrack! This game was born with the idea of practising the composition of different genres I hadn't tried before. 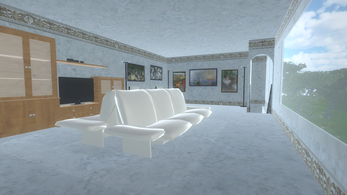 I also wanted to implement the idea of using Sweet Home 3D, a program to design houses. So, with that promise, I selected five genres: action/platforms, racing, electronic, terror and purely classical. Each piece has a level. Due to the recent death of my hamster, Eldamar, I decided to dedicate this game in his memory, and with time were born the two extra levels, that with the music in the menus, contain typical orchestral music in honor to my pet. Explore over five levels plus two extra levels and complete specific tasks in them! As I am not a programmer, it is very simple and you don't really have instructions about what to do in each level, but even without reading the description I can say you what to do in one word: exploration! But they are not exploration in the sense of my two previous Unity games, this time the levels have more elaborated scenaries depending of the genre! This is like an introduction level. 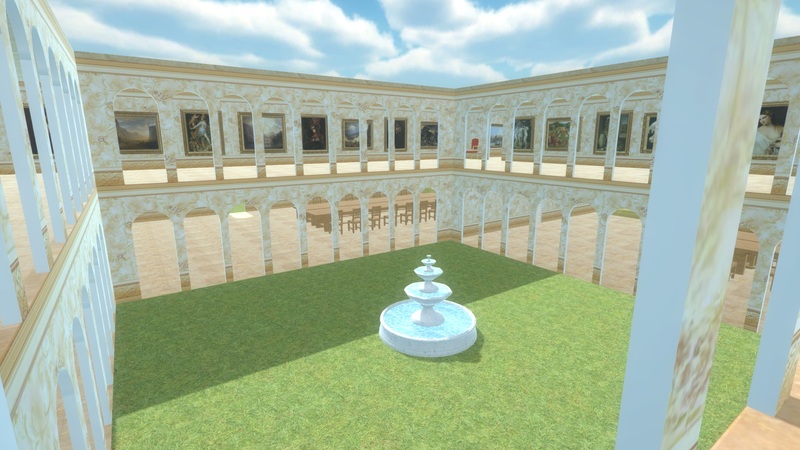 The idea was to create a house similar to one from the european romanticism, but the music I had in mind in tests was Spring by Vivaldi, so I guess it is more baroque than romantic. Also in the moment of tests I was studying baroque art for university, I guess that could have influenced too. In this enormous house you will see tons of paintings from the early times to romanticism included, featuring artists as Jan Van Eyck, Jean Fouquet, Michelangelo, Leonardo da Vinci, Vermeer, Caravaggio, painters of the Hudson River School, and many more! The direct inspiration for the style of the music was, of course, Vivaldi. This level was the last that came to my mind if we don't count the extra levels. I discovered the prefabs of cars and planes while I was creating the Futuristic Tower, and time later I tried to drive them. The car was easy, not the plane. 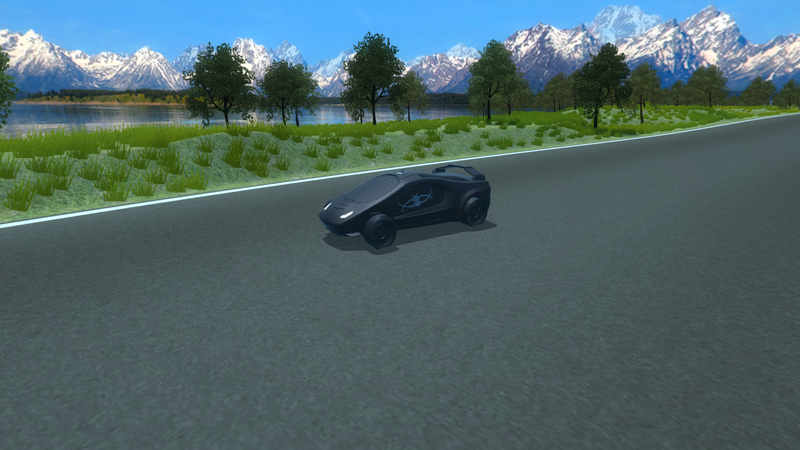 So, I had the idea of creating a driving game! About the design of the car, I was not sure at the beginning. I thought in to create multiple cars with a script to enter them but I guess that was too much for me, so I went more simple. After hours testing the texture for my logo, I could finally have it in what I call the FegeCar! This level is just about driving in the circuit, but I challenge you, how many laps can you drive without getting off the driving circuit? The direct inspiration for the style of the music was the soundtracks of the Dragon Ball games, most specifically the Tag Team game for Playstation Portable. For this song I used the vst Colossus by East West, I wanted to test it, but I hardly doubt I will use it again since this electric guitar has a limited customization, but who knows. This is the only level I have done using third person, and I used a couple scripts for the camera, for moving it with the right button of the mouse and for zoom using the wheel of the mouse. The camera is a bit confusing, and that's why I let the mouse visible. If you don't want to see the mouse when driving, just put it in a corner. This was the first level I began to create. The idea was to create a kind of futuristic enviroment because I wanted to try to compose music in the style of Ratchet & Clank soundtracks, and I guess it is not bad. 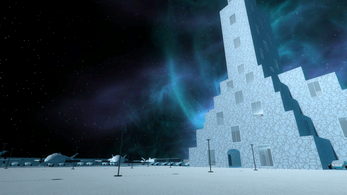 The enviroment is a kind of airport with planes and cars and a tall tower in the center. Imagine that being a colony in a planet, for example. You should go up to the top of the tower, and basically that's the task. As I have said, the music is a direct inspiration of Ratchet & Clank soundtracks, more specifically Ratchet & Clank 1, Ratchet & Clank 3 and Ratchet & Clank Size Matters. When I had this idea, this was the level I had more illusion in to create. This one has also some scripts I'm proud, because it was hard for me to find how to do it and I had to think about it, but I did it! In this level the sound of the steps is activated to increase the sensation of loneliness, and the music passages are divided by silences on purpose to increase the stress. I am proud of the result of this level and I hope to scare you at least a bit! 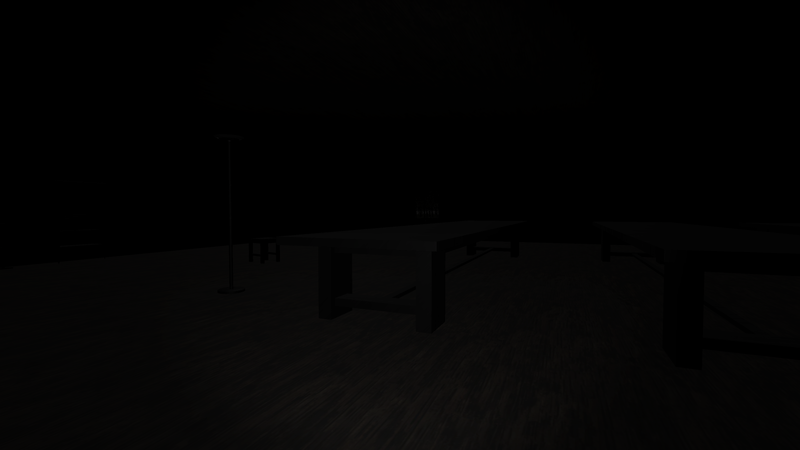 You appear outside, near a little building, in the darkness. Following the road you will reach a big mansion. Can you discover the secrets? I give you a couple clues! There are two secrets in this house, and they are in what we can say typical terror places in houses. Do you guess where they are? Can you reach them? This extra level at the beginning was going to be a little home to try to export it to android but I changed my mind when I was going to work on it after seeing some cool things. In the free 3D objects for Sweet Home 3D I found very cool modern things, like musical instruments, computers and cameras. Then I decided it was going to be a more personal space. The house is divided in two rooms connected by a hall. In the center of the hall there is the artwork I made for my book, The Lays of Assiriand. Then, depending of the side to go to one or another room, there are different frames with images. Going to the right side you will go to my room, and in the hall you find images of Eldamar the Hamster and also Jackie the Dog, that is still alive. I also added that painting by Van Gogh. The idea of the paintings in the extremes was to be a image of a place to visit in the future but as I needed space I planified to put there this painting, that represent my love for the north countries, the dark, and also the expressionism. Entering in my room you can see things related with me, like a computer with big monitors, headphones, and musical instruments like a electric guitar and drums. The paintings I included in this room are paintings related with what I want to specialize in the future: scientific art. The red painting with two rings is a image created by me, representing Ciriliand, one of the worlds of my book. Thanks to the painters for letting me use the paintings! The left room is a room related to my girlfriend Raquel. The animals that appear are Abby the Hedgehog and Cuqui the Agaporni, and the painting is the Great Wave of Kanagawa, representing her love for Japan. In her room you can see things related with photography, since that's her speciality. In the walls you can see frames with some of her photographies. I really love the final result. Finally, in the superior room, as it is a modern house, I wanted to add some paintings from impressionism to the contemporary times, but focusing in impressionism mostly. This level is in memory of Eldamar the Hamster, who died in 24th december 2016. It is a cage, and you may think, what a way to honorate his memory, but don't think that, because the cage was his home. When I put him out, many times he just wanted to come back inside. I think he had a happy life and I will always remember him. The cylinder supposedly is a tube, and the balls are just a game addition to play. In the simulated walls of the cage you can see photos of him. Rest in peace Eldamar, I will always remember you. I think this game requires a bit of description about the download files since there are a few. They do not depend of each other and can be downloaded separatelly. My Home Unity Game is this game, full. Eldamar The Hamster Unity Game is the level "In your memory" only, without menu. Eldamar The Hamster Android Game is an apk you can install in your android device, and it is a smaller version of the "In your memory" level, specifically made for android. I've been wanting to do a Unity apk for android since I began with this program and although I haven't been able to convert a normal project into android because the computer limitations, I just made this smaller version in memory of Eldamar, and now I've finally done what I wanted. The controls for that are very simple, it uses the touch screen. In the rar there is an image to guide you about the controls in case you need help. For some reason, I've tested it and playing vertically it works perfect, but playing horizontally it bugs sometimes when you want to walk forward. I have no idea about why this happens but I think it's okay since it's not a big thing. I guess this will be my last game created with Unity. I don't know about the future, but it was hard to do and a bit desperating because the computer I used, although it is not bad, it is not enough for Unity. 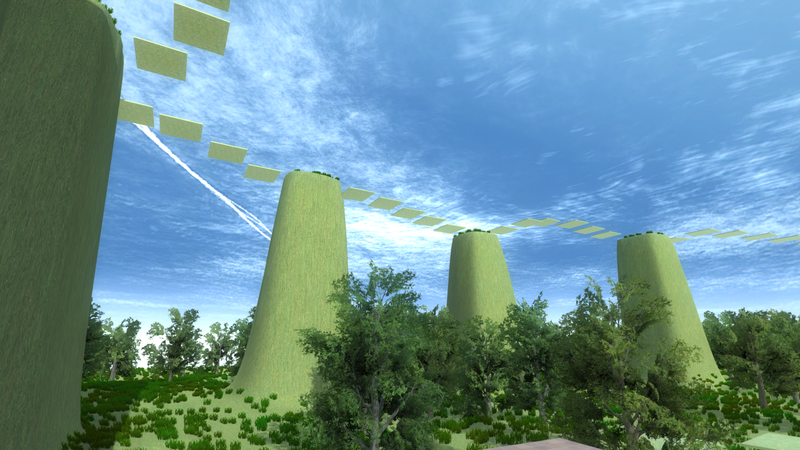 These levels have many gameobjects because the buildings. Even so, it has been a good experience, mostly talking about having the game finally done, and also having in mind the experimentation I've done with the soundtrack. I think it is a good way to say goodbye to Unity.